♥ Unique Tour A journey to the places where history was made and a nation was born. This excursion takes you to all of the places that make Paris the first American city outside the U.S. Walk in the footsteps of Benjamin Franklin, Thomas Jefferson, John Adams… and so many other great figures of American history. you will discover where the two treaties of Paris were signed, learn about the Louisiana Purchase at the time of Jefferson and see where former U.S. Presidents lived when they stayed in Paris. The goal of this tour is to explore all the connections between France and the new Republic during the war of Independence. You will discover the reasons as to why we have so much in common. Your Licensed English-Speaking Guide, graduated from the university, will pick you up in front of your hotel or apartment in a private luxury vehicle. Before starting the tour, he will give you a complete introduction to the history and show you the exact itinerary of the tour on an appropriate map. To prepare his commentary and give you the best explanations possible, your guide travelled several times to the U.S. (Monticello, Mont Vernon, Yorktown, Philadelphia, Washington DC ….) He is therefore able to give you accurate details throughout your tour, in addition to sharing his knowledge. The Concorde Square, just between the Champs Elysées and the Tuileries Gardens, is an ideal starting point to begin your tour. You will learn how France became the first country to recognise the independence of the new Republic in 1778, 5 years before the final treaty was also signed in Paris in 1783 with Great Britain. The actual U.S. Embassy is located near the Place de la Concorde and was America’s first diplomatic mission (some of the « founding fathers » such as Benjamin Franklin, John Adams, Thomas Jefferson and James Madison were among the first envoys to France). 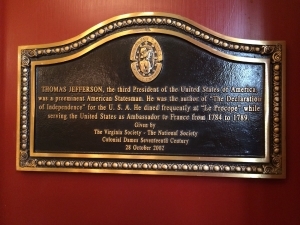 Following this, you will discover where Thomas Jefferson lived on the Champ Elysées and you will learn about his life in Paris. Thomas Jefferson, theorist of the American Revolution, drafted the Declaration of Independence. He replaced Benjamin Franklin as a second ambassador in France from 1785 to 1789 and was in Versailles when the French Revolution started. You will continue your revolutionary adventure whilst driving through the 16th arrondissement, in the Auteuil district. Ideally situated between Paris and Versailles at the end of the 18th century, the village of Auteuil is known as the American district in Paris. Your guide will share with you his experience of the area and lead you to the most important sites : the Yorktown square, Place des Etats-Unis with the statue of Washington and Lafayette, John Adams, and Benjamin Franklin’s residence. 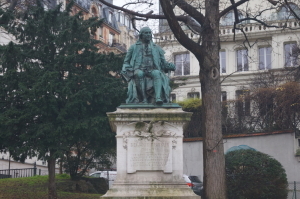 As a signer of the Declaration of Independence and one of the framers of the U.S. Constitution, Benjamin Franklin spent many years in France between 1776 and 1785. Following this, you will be driven on the left bank to see other major attractions linked to the American Revolution and you will enjoy a walk in St-Germain-des-Prés. 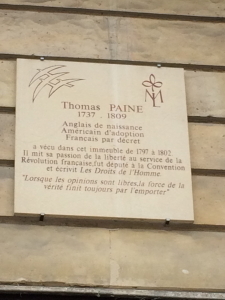 See where Thomas Paine and John Paul Jones (the father of the United State Navy) lived when they stayed in Paris. You will have time to wander up the cobble-stone streets of the capital and explore some art galleries and very authentic books stores. A big part of the book collections of the Library of Congress was in fact purchased by Thomas Jefferson in those little streets .A significant event in American history took place on 3 September 1783 at the Hotel d’ York at 56 rue Jacob ; the signing of the Treaty of Paris between Britain and the United States, which ended the American Revolution and granted the U.S. its independence. The signing followed the American victory at the Siege of Yorktown, won with assistance of the French fleet and French army. 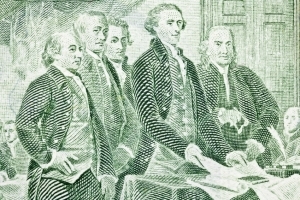 The American delegation included Benjamin Franklin, John Adams and John Jay. At the conclusion of the tour, your guide will bring you to the oldest coffee house in Paris, the famous Café Procope opened in 1686 where you will have the opportunity to enjoy a cup of coffee, seated in the middle of old paintings and furniture, like Voltaire’s table or Napoleon ‘s hat which recreate the atmosphere of the time. With your guide you will relive the movement of the lights and learn about the history of this emblematic place where Benjamin Franklin, Thomas Jefferson, John Paul Jones, Voltaire, Diderot used to meet at the end of the 18TH century. It is here within these walls that revolutionary ideas were born in France. Certainly the best place to finish your revolutionary adventure before being dropped off at your hotel !